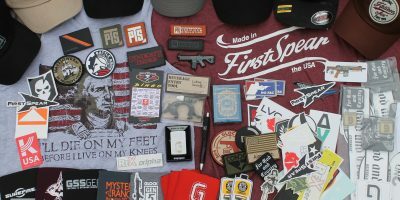 Quick mention to a product I stumbled across in the MilSpecMonkeystore while I was doing my usual rounds of online patch shopping. If you’re after patch display area, this is definitely one of the best options available on the retail market. It’s called Halco Luxmed Loop and MSM are selling it by the yard right off the 60″ roll in exactly the same way you’d buy camo fabric or 500D cordura. For those not using imperial that means you’re getting a total of 1.36 square metres of loop area for about 18 dollars. I chucked a pair of 32R G3 Fields down on top for size comparison sake. Not a small surface area, as you can see. I was given this stuff by the monkey, however as per usual this is something I specifically requested because I needed patch display materials anyway and I think it’s good value for the money if you want proper loop to put your morale items on. My opinion is not for sale however, fact is you can slap hook backed patches on scraps of old carpet or any vaguely fluffy material you like and you can probably obtain such a fabric for free if you hunt around. But if you do want something that’s smart looking, factory new, thin, light and very easy to display then this stuff is a better $ per square inch price than any other patch mats I’ve personally seen for sale. You don’t get edging tape or metal grommets for hanging of course it’s just raw loop, but the idea here is really to use the fabric in a project of your own. I’ve cut my yard up and used adhesive backed Velcro to attach it inside a wardrobe here in a simple manner for displaying all my manufacturer/brand logo patches. What you can see in the picture is only about half of what was supplied. But that’s just one option, you can either do something as simple as punching some holes and hanging up a piece with paracord or go all the to building a picture frame of the right size and using spray glue to create a huge fancy patch display board. The possibilities are endless really if you’re a creative type.